If you are wondering where are the best places to visit in Indonesia, then you are on the right page! Made up of over 17,000 volcanic islands, Indonesia is the tropical paradise that has something for everyone. The island of Bali has long drawn crowds from all other the world who come for the iconic rice paddies, beautiful beaches, yoga retreats, surf schools and coral reefs, but don’t you go thinking that this is all Indonesia has to offer! Beyond Bali in the rest of the country there are lots of amazing sights and cultural experiences just waiting to be explored. From the mountains of Bromo and Rijani, to the beaches of the Gili Islands and Lombok, the temples of Yogyakarta and Pramanban, the natural wonder of Komodo and the scuba diving paradise of Raja Ampat (just to name a few!) Read on to discover all about these incredible places to visit – but be warned – your Indonesia Bucket List is about to get super long! The Best Places to Visit in Indonesia – Including a Map! RELATED: Need some help packing for your trip? Read our Ultimate Travel Packing List (which comes with a free pdf download!) to make sure you have everything you need! Probably the most well known Island in all of Indonesia, Bali has been welcoming tourists in the millions for many years now. A lush island paradise, it is famous for it’s beaches, picturesque rice terraces, is a favorite with surfers, the home of hundreds of yoga retreats and day spas, and offers some of the top restaurants in the whole of the country! It’s no wonder it’s a tourist hot spot, is definitely one of the best places to visit in Indonesia and should not be missed on any Indonesian Bucket List! Here are some of the best place to visit in Bali alongisde the top Bali attractions and some of the activities and adventures available in each! If you want to live the high life in Bali, Nusa Dua is the place to be. The gorgeous beach here is home to several luxury resort hotel chains such as the Sofitel, Westin and the Grand Hyatt – and at prices a low as $100-$150 a night, you can experience paradise at a bargain price! It’s definitely one of the best places to see in Indonesia! Stay at the Sofitel Bali Nusa Dua Beach Resort – seriously. If just for a couple of nights. It is categorically one of the nicest hotels I have ever stayed in with one of the comfiest beds I have ever slept in. Add in the swim up bar, amazing restaurants, pillow menu and the fact you can arrange for someone to come and run you a luxurious bath in your own room (for FREE!).. if you want to feel like a star, the Sofitel is the place to stay. Click to compare prices here an start planning your luxurious stay. Stay at the Westin Resort Nusa Dua Bali – a haven of wellness and luxury. The rooms are to die for, the facilities are gorgeous (hop on their website and a take a look!) and the spa is like a little slice of heaven. So much so it is even called ‘Heavenly’! Click here to compare prices. Stay at the Grand Hyatt Bali – heralded as the crown jewel of resorts in Nusa Dua. Styled as a traditional Balinese fishing village, the resort, whilst boasting over 600 rooms still feels intimate. There are 8 dining options, a world class spa and facilities that just ooze luxury and wellness. Click here to compare prices. See A Traditional Balinese Cultural Show – The Devden Show is a mix of traditional Balinese dance, aerial acrobatics, incredible stage effects and hundreds of breathtakingly intricate Balinese costumes which take you on a 90 minute journey throughout the Indonesian archipelago. 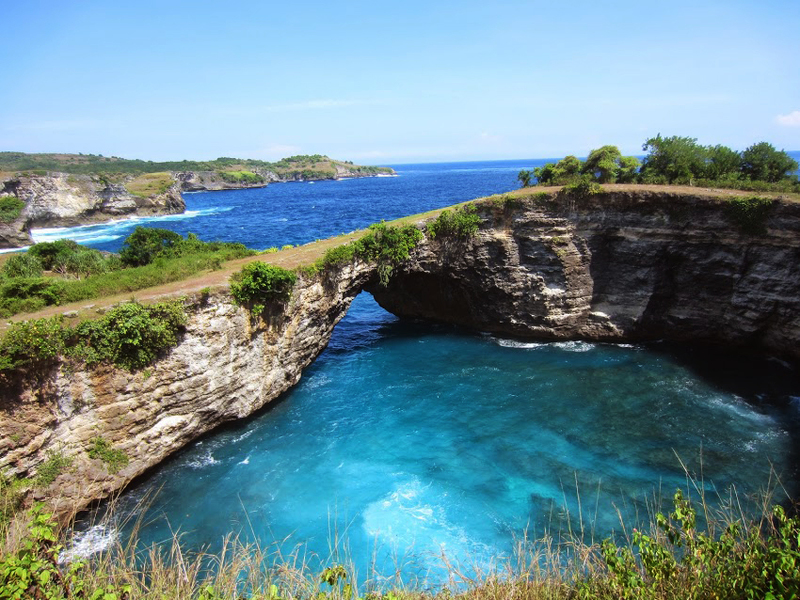 Nusa Penida is the large island (200km sq) located of Bali’s South West coast, and whilst tourist infrastructure is no where near as advanced as on the mainland, it is progressing rapidly. It’s one of the best islands in Indonesia, however, visitors must be aware that prices are inevitably more expensive here as even the most basic supplies are brought over by boat. 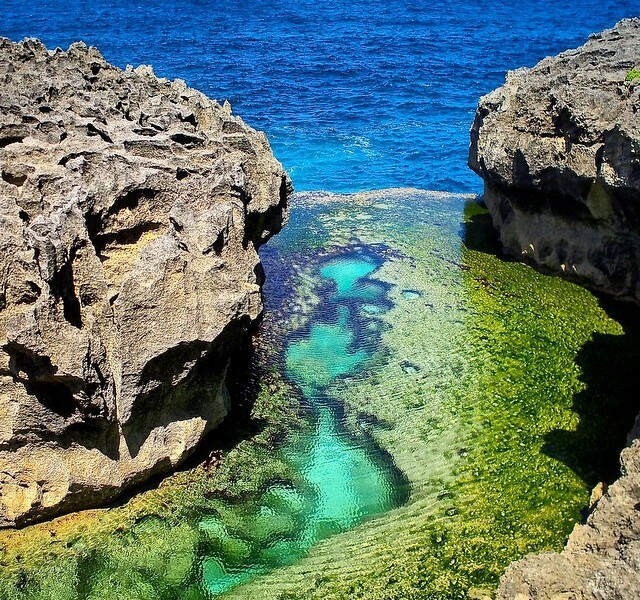 Nusa Lembongan – Smaller neighboring island celebrated for it’s surf, snorkeling and manta rays and the site of the underwater museum – everything you could need for some interesting underwater photography! Seminyak is Bali’s hip and upmarket tourist centre, packed to the brim with cool cafe’s, great shopping and with the likes of Ku de Ta and Mama San you’ve got some of the best restaurants in Bali just waiting to welcome you with open arms. Oh, and did I mention there is a superhero training facility?! Take a peek here at the Best Places To Stay in Seminyak. SuperHero Factory Bali – and its for kids and adults! Get your wine fix @ Vin + Seminyak – fine wine from around the world curated in a beautiful bamboo enclave. Potato Head Club – one of the hottest beach clubs on the planet. Come for the day, come for drinks, come for dinner – but whatever you do, make sure you visit this iconic spot at least once when you are in Bali. For the Balinese, Tanah Lot (Pura Tanah Lot) is one of the most culturally significant Hindu temples on the Island. For tourists, it is the most visited/photographed due to its impressive location on a crumbling rock-face jutting out into the ocean. And to really do the tourist thing – make sure you are here for sunset! RELATED: Combine Tanah Lot with Tegalalang Rice Terraces & Ubud Monkey Forest on this full day tour! Located in the highlands of Bali, Ubud is surrounds by the rainforest and revered for it’s insta-worthy rice paddies. It is here you’ll find yoga retreats, day spas, art and culture museums, hindu temples and hidden waterfalls. Ubud id one of the main places of interest in Bali and is well worth spending a few days exploring. Ubud Monkey Forest (Sacred Monkey Forest Sanctuary) – you can’t come to Ubud and not visit the monkeys! Just beware of valuable and shiny things, the cheeky monkeys can be handsy. Ubud Market (Pasar Seni Ubud) – pick up local crafts and arts from surrounding villages. Join a Yoga Retreat – 6 days of Namaste and Spa Treatments in Ubud’s highlands. Bliss. Get a dose of culture at one of the many art museums in the area. Noteable ones to include on your trip are ARMA (Agung Rai Museum of Art), Blanco Renaissance Museum and Neka Art Museum. Uluwatu is located at the south western tip of Bali and is home to the Pura Luhur Uluwatu Temple where the famous ‘Kecak’ dance is performed nightly. Crowds flock to the cliffside temple daily and stay for the performance that starts just before sunset every night. The area is also a favorite with surfers has one of the best nightlife spots in Bali which says goodbye to the weekend in style every Sunday night. Uluwatu Temple & the Kecak Perfomance. (Combine it with a dinner in Jimbaran to end your night) – easily one of the most interesting places in Bali and one of Indonesia’s top sights. Head to the bars over looking Uluwatu beach for the perfect sunset shots. Find your spot at the balcony at SingleFin (a must visit place in Bali) and sip cocktails on a Sunday night and celebrate the week that was as the sun goes down and tunes are turned up. Solo – often referred to as the Spirit of Java (they even have their own hashtag: #solothespiritofjava(!) is the historic royal capital of Java. A small city, it is one of the least ‘westernized’ places in Indonesia which is proud of its Javanese traditions. Visit Mangkunegaran Palace – a vast impressive structure filled with heirlooms from days gone by. Go shopping in the Antiques Market – here you’ll find nick nacks, art and jewellery at rock bottom prices. Head to the Batik Museum (also known as the House Of Danar Hadi) to learn about the history of the fabric and how it was made in the past and in the modern day. Semarang is the modern day capital of central Java, and although it is more of a business than a tourist destination, there are still a few things that shouldn’t be missed on your visit. Its old quarter features decaying dutch colonial architecture and the very impressive former Dutch built train station of Lawang Sewu. There is also a Dome Church and Chinese Temple within the city for those who love interesting architecture: Perfect if you are wondering where to go in Indonesia. Lawang Sewu – the old colonial train station built by the Dutch that was once the headquarters of the Dutch East India Company. The building itself now empty (apart from a couple of museum exhibits) and is home to one of the largest stained glass windows in Asia. It is also rumored to be haunted – but luckily (for me) I didn’t see anything spooky on my visit! Take a Walking Tour of the Old Quarter and see the magnificent Dome Church – the crumbling buildings make for some great photographs. Visit Sam Poo Kong (also known as Gedung Batu Temple) which is the oldest Chinese temple in Semarang and has a mix of Javanese and Chinese styles within its architecture. Prambanan is a ninth century Hindu Temple Complex dedicated to the Trimurti, the expression of God as the Creator, the Preserver and the Destroyer. Withing the grounds there are 200 temples featuring stone spires, sculptures and carvings. Located quite close to Borobudur, it is possible to visit on a half day tour whilst staying in Yogyakarta. Mount Bromo is one of the main Indonesian tourist places and stands tall at 2329 m is the most iconic and the most hiked mountain in Indonesia. Most tourists see the sunrise from the base of the mountain before trekking up in the early part of the day where the heat is a little more bearable. RELATED: Mt Bromo is one of the best hikes in Asia – Book your sunrise Mt Bromo tour here. Ijen Plateau (Ijen Crater) a volcano complex in East Java, is one of the unmissable sights in Indonesia. It is a unique place to see electric blue flames rising from the crater, which is also the site a large sulfur mine, and the acid in the volcanic lake is strong enough to dissolve clothes and eat through metal. It’s turquoise blue waters are a sight to behold, and you can book your Blue Fire Trekking Tour here to make sure you don’t miss out on this unique landscape. Komodo National Park is part of the Lesser Sunda Island Chain in Nusa Tenggara and is made up of three large islands (Rinca, Padar and Komodo Island), and numerous smaller ones, all of which are volcanic in nature. It is a beautiful place in Indonesia and the diving here is said to be some of the best in world, boasting a variety of marine life including whales, sharks and manta rays. And on land you’ll find the prehistoric looking creatures known as the Komodo Dragon or Komoto Monitor. They are the largest, heaviest lizards in the world and one of only a few that has a venous bite – and can eat a whopping 80% of it’s body weight in a single feed. If they aren’t enough reasons to make you keep your distance, I don’t know what is! Click for everything you need to know to plan your trip to Komodo National Park including how to get there, where to stay, where to eat and all the other incredible things to do there! And click here for a guide to Labuan Bajo, the closest town to the NP. The motor-free Gili Islands are a group of 3 tiny islands (Gili Air, Gili Trawangan & Gili Meno) located off the north west corner of Lombok. Known as a complete island paradise the sandy beaches and pristine coral reefs have been attracting visitors for years. Also a favorite with scuba divers and snorkelers, you can swim with turtles at Turtle Point on Gili Meno or go wreck diving off Gili Trawangan. Oh, and the swing in the ocean is always a good spot for photos! You can see why it is one of the main Indonesia tourist places, right?! Forming part of the chain of the Lesser Sunda island, Lombok Island has long been overshadowed by it’s bigger island brother of Bali. Boasting long stretches of white sand beach, epic surf, lush rain forest interior, walking and hiking trails and those oh so island-vibe sunsets, there is something to please every style of traveler. And an incredible Pink beach located on the Northern coast of the island should certainly not be missed – It is one of the most loved Indonesia tourist places. Located on Lombok, Mount Rinjani (Gunung Rinjani) is the second highest volcano in Indonesia that draws hikers all year round. Most come for the sunrise hike, often departing in the very early hours of the morning to reach the summit for sunrise. And I have been assured that they are rewarded with incredible views! It’s an Indonesia must see! RELATED: For the adventurous among you, this 4 day trekking tour will see you reach the summit of Mount Rinjani and see all the other remarkable sights on the way up too! Lake Toba is the largest lake in Indonesia and was created in the crater left by the eruption of a super volcano. Perfect for those that want to relax but prefer being surrounded by the mountains over beaches, and a popular holiday destination for Indonesians, it a great place to unplug from the world for a few days. TB Silalahi Museum in Balige – learn about the Batak culture and watch (or join in!) with some traditional dance! Samosir Island – the largest island in the centre of Lake Toba is actually bigger than Singapore! Book a couple of nights stay on the Island for the ultimate in relaxation. Take a drive to Sipispis – what is more relaxing than spending the day by a waterfall? The Tana Toraja Regency in the Indonesian highlands of South Sualwesi is one of the most interesting and culturally diverse places you could visit. Discovered only in the 1920s this society had lived with no existence of the outside world for centuries before the arrival of Dutch missionaries. They are now mostly famous for the complex death rituals that they practice which include keeping the deceased in the family home for months after death, burying their deceased in cave graves or hanging from cliff-sides, and the festival known as ‘Ma’nene’ where the deceased are removed from their final resting place for the corpse to be cleaned, re-dressed and displayed in the village. Climb Mount Sesean – not the highest peak in Indonesia, but a great hike for all capabilities with some epic viewpoints looking out over the countryside. Pick up some locally grown exquisite Arabica Bean Coffee. Explore Londa – a cave grave site which tourists can enter and learn about the history of the residents. Toraja Death Rituals – Cave Burials, Effigies.. and the Walking Dead! The scuba diving paradise of Raja Ampat Islands (which literally means ‘Four Kings’) is home to some of the most diverse sea life you could ever hope to see and there are more recorded species here than anywhere else on the planet. For those that don’t scuba dive, the snorkeling is also incredible (and sometimes better than scuba diving! ), the beaches are beautiful, there are rock paintings and caves are on Misool Island, and the crimson bird of paradise lives on Waigeo Island. Whilst Borobudur Temple is technically located in Central Java, it is most easily reached form the city of Yogyakarta. A UNESCO Heritage Sites, it was built in the 9th Century it is one of the largest Mahayana Buddhist temples in the world. A favorite with photographers, the impressive temple is best at sunrise or sunset. Book your sunrise tour here and experience the magic for yourself. RELATED: Spending more time here? Check out these other things to do in Yogyakarta to keep you occupied. And that’s a wrap folks! I hope this travel guide has given you lots of ideas for planning your travels in southeast asias and trip to Indonesia and has shown you all the top sites in Indonesia. And I can totally understand if your Indonesia bucket list has suddenly become super long! FYI: I visited a few of the location on this list as part of the Wonderful Indonesia Trip of Wonders 2017 operated by the Ministry of Tourism, but all opinions, as always, remain my own. Hi There! Thanks for reading my post about The Best Places to Visit in Indonesia! I just wanted to let you know that this post contains affiliate links, which means if you purchase something after clicking a link, I may get a small commission – which is at absolutely no cost to you. If you enjoyed this article and are going to be searching for some of the things I mention anyway, I would love it if you could click through from the links above & thank you in advance! Read my full Disclosure here. Fantastic post and so many awesome places to visit! I’ve only been to Bali so far in Indonesia which was a great first taste, but I can’t wait to visit again! Mount Bromo is high on my list of course! Thanks Mike! Indonesia is an incredible destination to explore – I hope you get to Mount Bromo soon! Thanks Vicki. I’m heading to Jakarta in September so your post was handy!!! Thanks Danielle! Hope you have a great time! Bali Jakarta is the best place according to me in Indonesia. It has all the elements which makes a holiday A WOW experience. Hi Vicki, you really made my travel plans easier. You ‘re list of places to see is awesome.